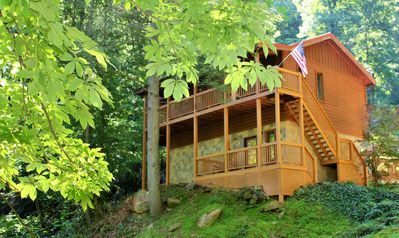 When you stay at Bear Hyde, you can enjoy the best of all worlds: the privacy of a cabin, the amenities of a resort, and the convenience of being just a few minutes from scores of local attractions. 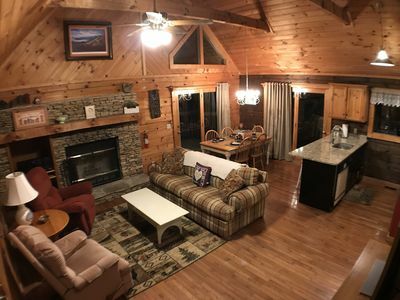 This three-bedroom duplex cabin, with two kitchen areas and living rooms, it’s especially well suited for two families vacationing together. 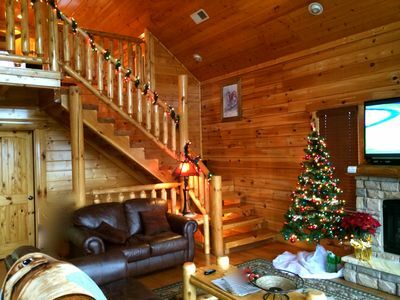 Bear Hyde is located in Pigeon Forge’s Big Bear Lodge and Resort at the Cross. 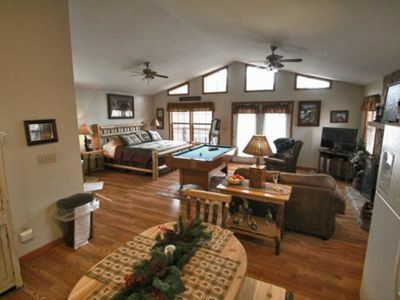 Staying in the cabin gives you free access to the numerous resort amenities. 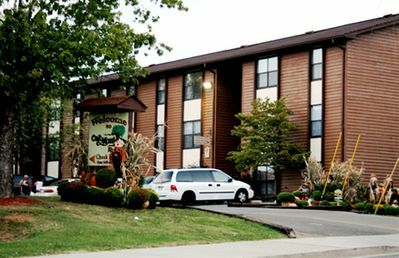 These include an indoor heated pool and hot tub that are open all year long and an outdoor heated pool and hot tub for use in the summer. Chaises and tables on the patio surrounding the outdoor pool make it a relaxing spot for hanging out after a swim. The resort’s fitness center offers cardio and resistance machines, and its game room includes both foosball and air hockey. 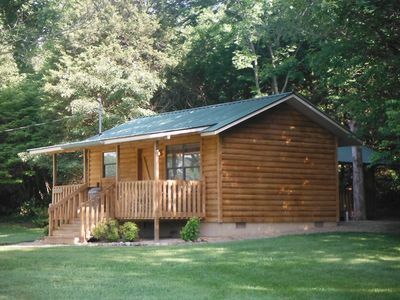 As for Bear Hyde itself, the cabin is a spacious, relaxing retreat. 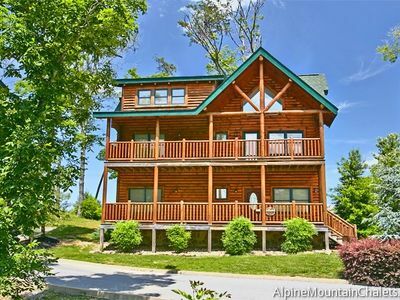 From its decks and balcony you can look out over the lush woodlands toward the Smoky Mountains. 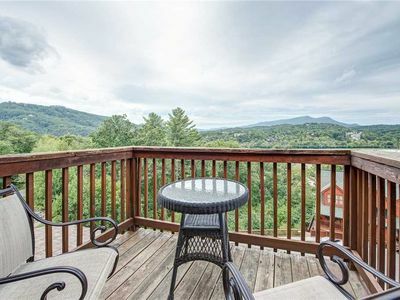 The upper balcony is a particularly lovely space for enjoying your morning coffee as the mist rises above the mountains or for savoring a late-night drink beneath the star-studded sky. The main deck, which spans the width of the cabin, is furnished with rockers so that everyone can revel in the fresh breeze. What’s more, enclosed on one of the decks is a hot tub. When you return from a day on the go, you’ll love unwinding among its massaging jets of steamy water. Each of Bear Hyde’s three floors has a bedroom with a private bathroom. The master suite, on the main floor, includes a king-size bed; the other two bedrooms each have a queen-size bed. In addition, sofas in the main floor’s great room and the downstairs living room open into beds for two, so that the cabin can sleep up to ten people in total. As a bonus, the main floor’s bathroom includes a washer and dryer. Here’s your chance to not only pack light but to even return from vacation with clean clothes in your suitcase. The main floor’s great room is open and airy, with a double-height ceiling and a fireplace that will add a warm, welcoming glow in winter. Once you kick back in the roomy sofa or the plush armchair you might never want to get back up! Fortunately there’s a large flat-screen TV with cable and free WiFi to keep you entertained as you laze. Upstairs is another sitting room with its own TV, though you might prefer to gaze out the windows instead; the view is glorious. The great room includes a fully equipped eat-in kitchen. Whether you’re whipping up pancakes for breakfast, a holiday feast, or margaritas for a nightcap, you’ll find all the appliances, cookware, and tableware you could possibly need. 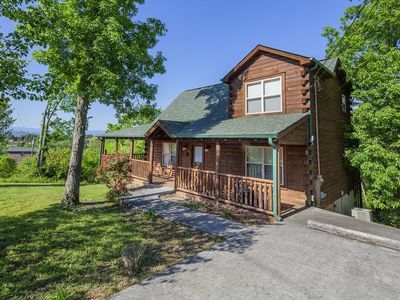 In addition, Bear Hyde has a grill on its main deck, so you can treat yourself to a barbecue. 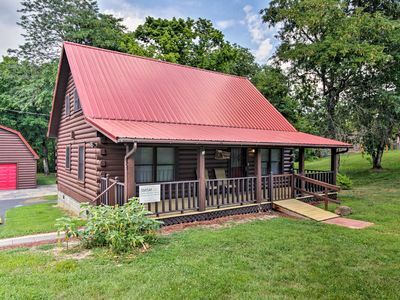 The cabin’s downstairs has its own kitchenette, with a refrigerator, a microwave, and an all-important coffeemaker. Also downstairs, in addition to a bedroom and a bathroom, is another living room. 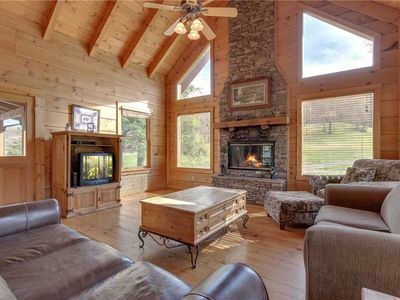 Like the great room, it includes a TV, a fireplace, and blissfully comfortable seating, along with doors that open onto the lower deck. 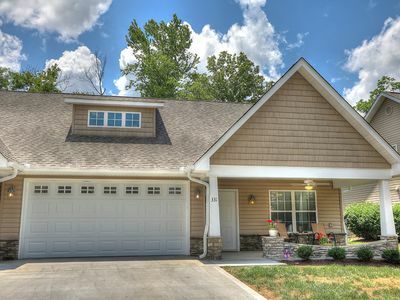 Though you could happily while away your entire stay without leaving the resort, you’ll definitely want to take advantage of Bear Hyde’s proximity to the Pigeon Forge Parkway. 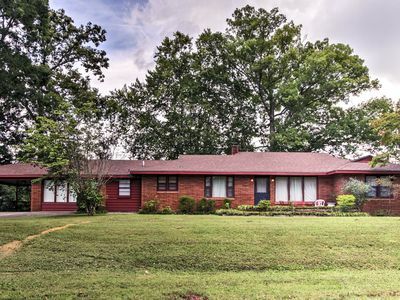 Little more than a mile away, the parkway is home to dinner theaters, the Titanic Museum, mini golf, go-kart tracks, the Tanger outlet mall, and so much more. 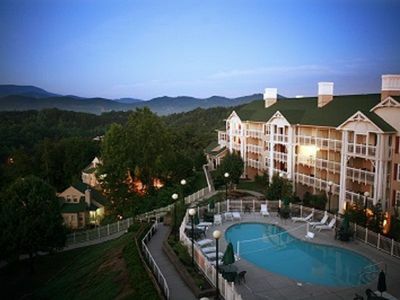 In addition, Bear Hyde is just 20 minutes from both Dollywood and the Great Smoky Mountains National Park. When you stay at Bear Hyde, a fabulous time is practically guaranteed. See for yourself: Make your reservation today! 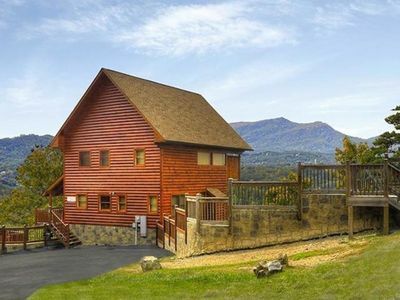 Panoramic Mountain Views with Movie Room and Hot Tub in the Preserve Resort! Indoor Pool!!! !One, Two, and Three Bedroom Condo's with Swimming Pool!!!! 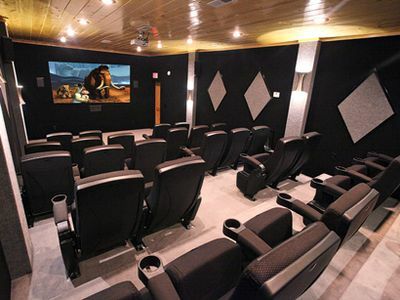 Views, Theater, Pool, Arcade – It has it all! 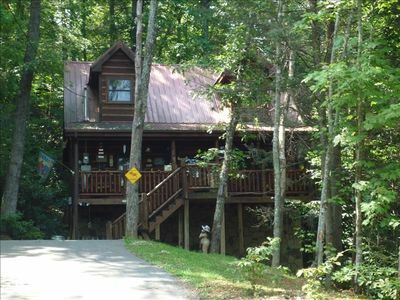 Beautiful, Affordable, Cabin Near Pigeon Forge For Couples! 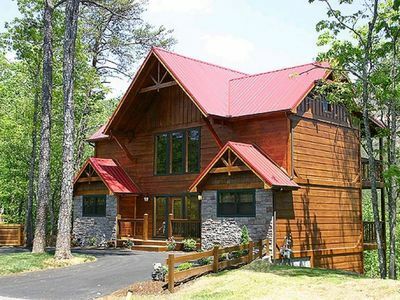 Bear Hugs - Great Cabin! 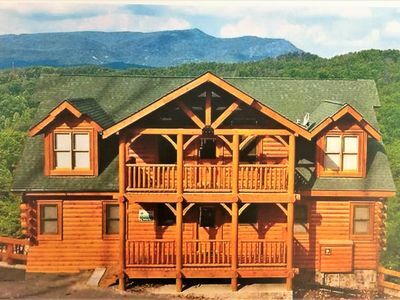 Hemlock Haven: A Cozy Mtn Retreat Located between Pigeon Forge and Gatlinburg! 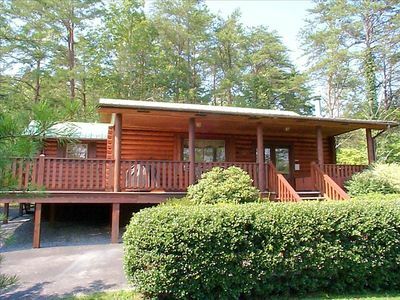 Cozy Cabin w/ Screened Deck Near DT Sevierville! 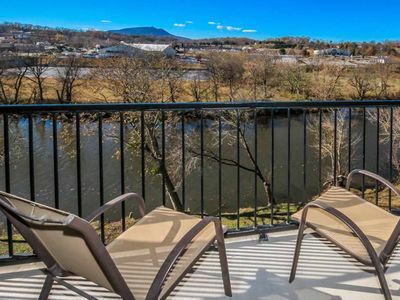 Riverfront condo w/ balcony & shared pool/hot tub - close to Pigeon Forge!